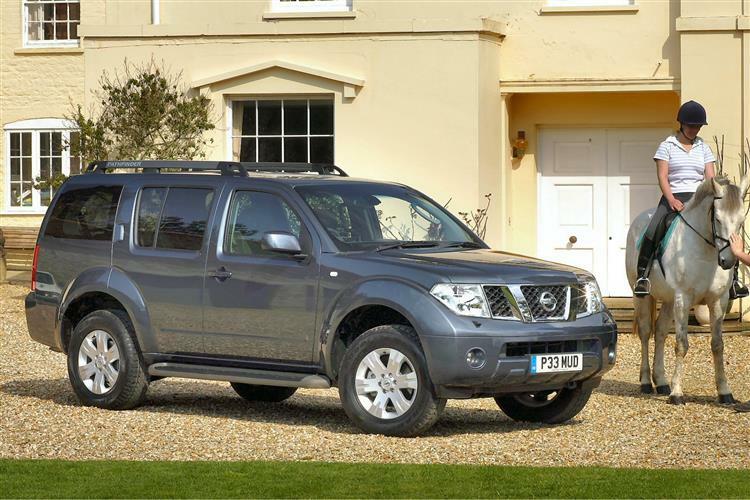 Although to the casual observer Nissan appeared to be overburdened with 4x4 models at the time of the Pathfinder's arrival, there's always space for a model as good as this. Based loosely on the Navara pick up chassis, the Pathfinder slotted in above the X-Trail and Terrano and below the sporty Murano, offering a rather more 'lifestyle' alternative than the desert-issue Patrol. 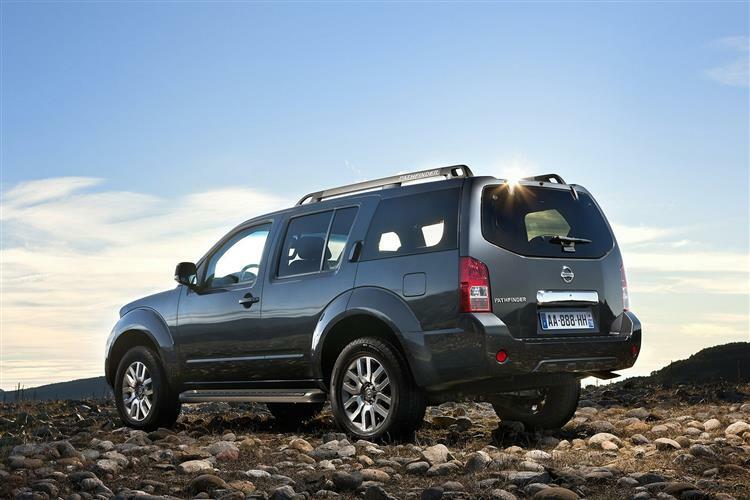 Although the engine line up is limited, the Pathfinder has became a global success for Nissan and looks like decent business on the used market. For a vehicle that's only been around since March 2005, the Pathfinder has come in for a lot of attention. Engineered for the European market at Cranfield, Bedfordshire and built at Nissan's NMISA factory in Spain, the Pathfinder's rugged styling - derived from the 2003 Dunehawk show car - is both practical and good-looking and aimed at young active families. When it was first introduced, it was offered solely with a 2.5-litre 172bhp dCi diesel engine and was available in S, SE, SVE pr range-topping T-spec guises - the S being supplied with five seats and the rest with seven. 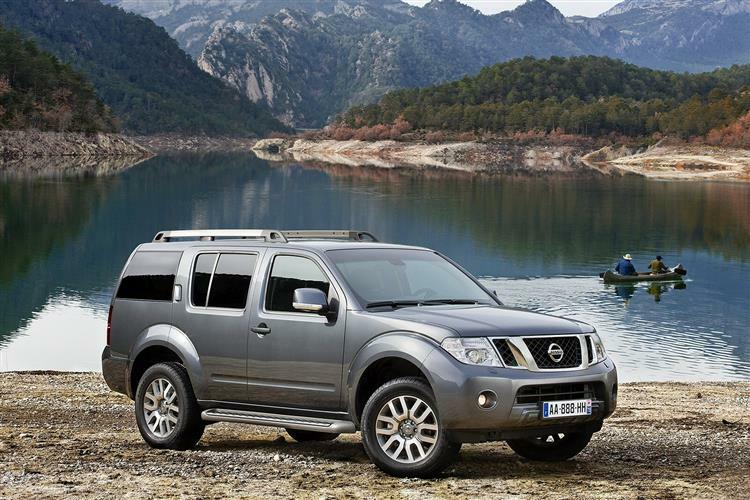 Five months later, Nissan launched a 4.0-litre V6 engine which, they claimed, made it the quickest seven-seat 4x4 available at the time. Based on the 3.5-litre 350Z coupe's engine architecture, this fleshed-out the engine line up for those who could never countenance a diesel. Further changes occurred in May 2006. Euro NCAP announced that the Pathfinder had achieved a four-star rating for adult occupation protection making it one of the safest big 4x4s available. 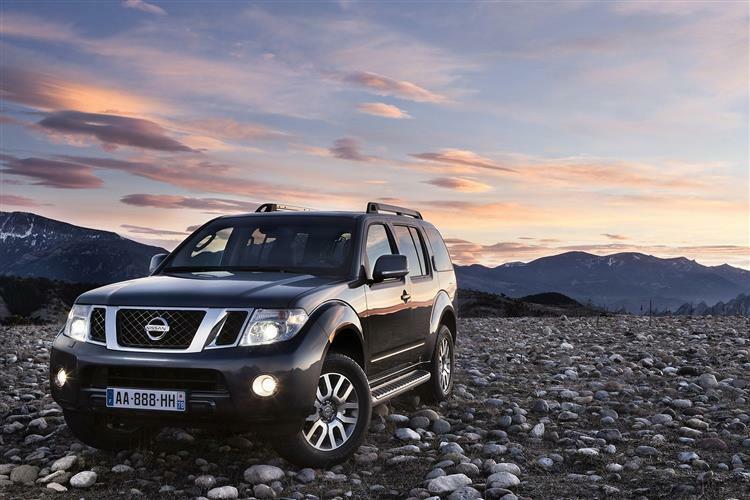 At the same time, Nissan revised the entire Pathfinder line-up and cut prices by as much as £3,000. In addition to this, the company threw in £2,000 worth of Technology Pack on a new Pathfinder Sport trim level. In place of the old S, SE, SVE and T-spec line-up, the Pathfinder now came in three varieties: Trek, Sport and Aventura. In 2008, the entry-level Trek model was given a third row of seats giving all Pathfinders a seven-seat capacity. There's often a substantial gulf between the way 4x4 buyers actually use their 4x4 vehicles and the utopian visions laid out in commercials and publicity material. The ad men present the public with a rose-tinted vista of family life in which every spare moment is crammed with wholesome outdoor activities from horse riding, to mountain biking and rambling to kite flying. Of course, the 4x4 vehicle itself is the hero of the piece: always on hand to be loaded with beaming children and expensive equipment, ready to trundle off into the countryside at a moment's notice. Nissan's Pathfinder 4x4 certainly has the ability to access remote locations with a family of catalogue models and their camping gear safely stowed inside but it's also adept on the school run, on the motorway and in the supermarket car park - the places where real people are most likely to use it. The Pathfinder range is split into three trim levels named Trek, Sport and Aventura. Until 2008, the entry-level Trek models did without the rearmost row of seats and so offered a five-person capacity but all other Pathfinders had the ability to seat seven. 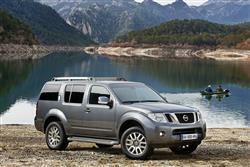 Externally, the Nissan family face, as seen on 4x4 models across the manufacturer's range, is very much in evidence. The V-shaped grille with central Nissan badge gives a suitably imposing frontal view, one which is accentuated by a wide air intake in the underbumper and bulging wheelarches. As you ascend the range, more styling features are added to spruce-up the vehicle's appearance, 'Pathfinder'-branded roof rails help, as do front fog lamps and side steps. Overall, it's a cohesive and modern, if somewhat unremarkable, design which lacks the impact you get with a Discovery but certainly isn't going to offend many people. The interior decor is tidy and largely functional, although there's little by way of design flair in evidence. The air-conditioning is controlled by dials that rock from side to side: these are unusual but they seem highly counterintuitive and don't really represent an improvement over traditional twisting dials. Leather upholstery is standard on Aventura models but the cloth trim on lower spec derivatives has a netting-like texture and may prove difficult to clean once your kids have melted a chocolate bar to it. The Pathfinder is available with a variety of nice technological features including Nissan's excellent Birdview satellite navigation system, a colour reversing camera and keyless entry but even the base models feature dual-zone climate control, electric heated mirrors, electric windows, ESP and traction control. 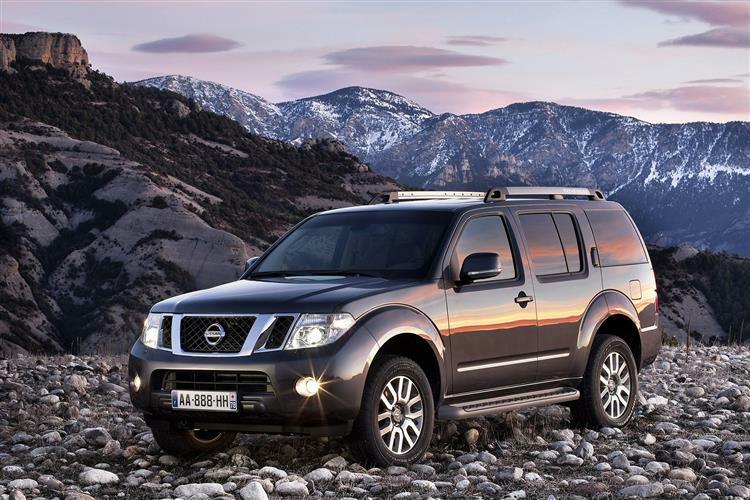 The Pathfinder is a rugged and, for a modern vehicle, a relatively simple thing. Not a whole lot goes wrong although rough treatment off road will cause the underbody protection panels to detach themselves in pretty short order. The paintwork is very strong and both engines have yet to give any noticeable problems. Check the exhaust for damage and on manual cars ensure the clutch hasn't been immolated through poor towing technique. (approx based on a 2005 Pathfinder 2.5 SE) A clutch kit for the Pathfinder retails at around £240 while front brake pads are around £55 a pair with rears retailing at around £45. A new radiator is around £250 with a starter motor also costing about the same and a fuel filter is around £18. The vast majority of Pathfinder customers will specify the 2.5-litre dCi engine although the 4.0-litre V6 petrol unit does offer more by way of performance. The 174PS common-rail diesel unit offers up its maximum power at 4,000rpm and a hefty maximum torque output of 403Nm is available as low as 2,000rpm. The Pathfinder is a big vehicle but the dCi engine seems up to the task of shifting it around, just don't expect anything too exhilarating. There's a decent slug of acceleration available from low speeds and if you keep your foot planted, 60mph is a none too shabby 11.7s away. The Pathfinder will return an average of 31mpg and tow up to 3 tonnes, although, obviously, not at the same time. The 6-speed manual gearbox is user-friendly enough and highly preferable over the slow-witted 5-speed automatic option, which seems to increase engine noise substantially at motorway speeds. The 265bhp V6 petrol engine option is a development of the unit found in the 350Z roadster and it can hit 60mph in 8.9s. It's only offered in plush Aventura trim. 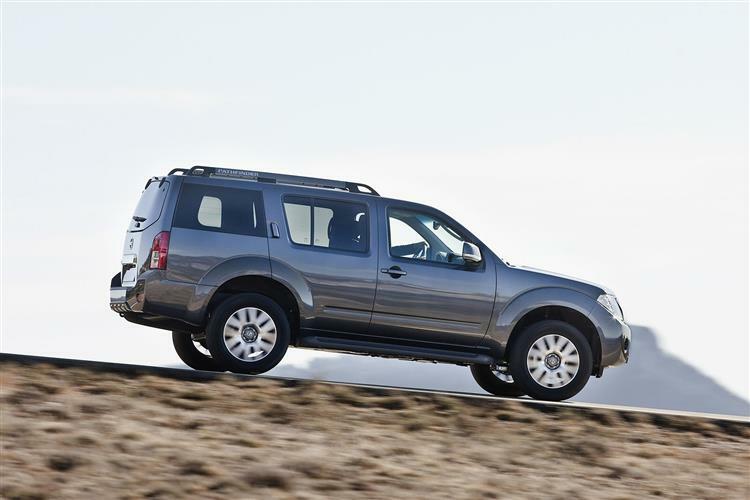 The Pathfinder is a comfortable cruiser, even if overtaking manoeuvres do put a strain on that engine, but it also takes to winding country roads with a level of composure not normally associated with big 4x4 vehicles. Pick up the pace and the body rolls in corners and pitches under braking but not unnervingly so. The steering is reassuringly accurate and the braking feels secure. 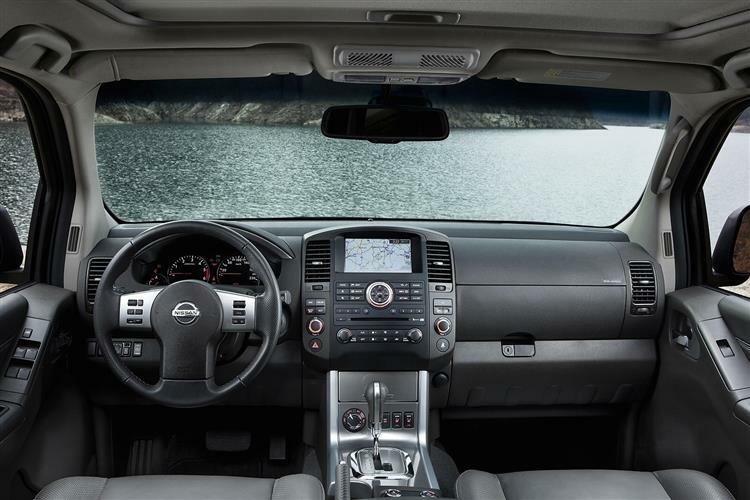 All Pathfinders feature the Nissan ALL MODE four-wheel-drive system which includes a low ratio mode for proper offroading. Traction is governed by a special ESP+ system that marshals the ABS brakes, the traction control and the active yaw control for optimum performance both on and off the tarmac. 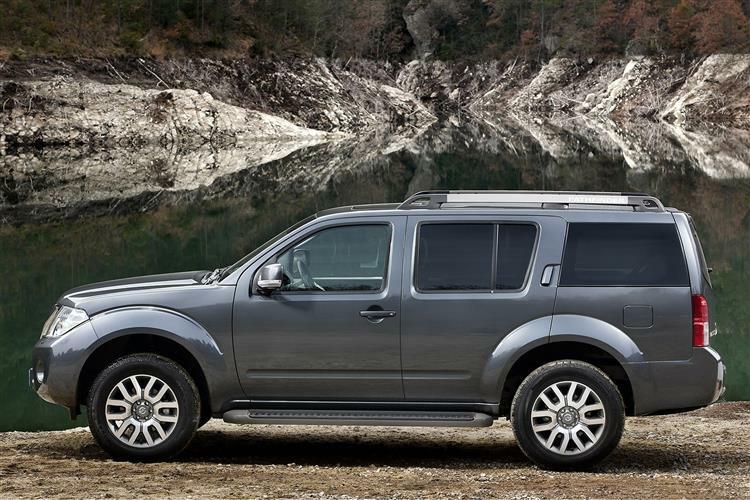 If you can't run to a Land Rover Discovery3, the Nissan Pathfinder is a very capable Plan B. With cars now starting to dip regularly into affordable territory, you'll get a lot of very reliable vehicle for your money. Our bet would be an early 2.5-litre SE. They're relatively common so you'll be able to pick and choose and with the 2006 Pathfinder price decrease from new trickling down to used prices, they now look very good value.